Certain homes have you at “hello”. Each space in this type of home was usually done with such precision and taste that it not only inspires you but also expands your senses and teaches you something new. Melody’s home, from @MyHouseOfFour, does this to me. It opens my eyes, makes me look at the details carefully and I know that what I see here won’t be forgotten easily. 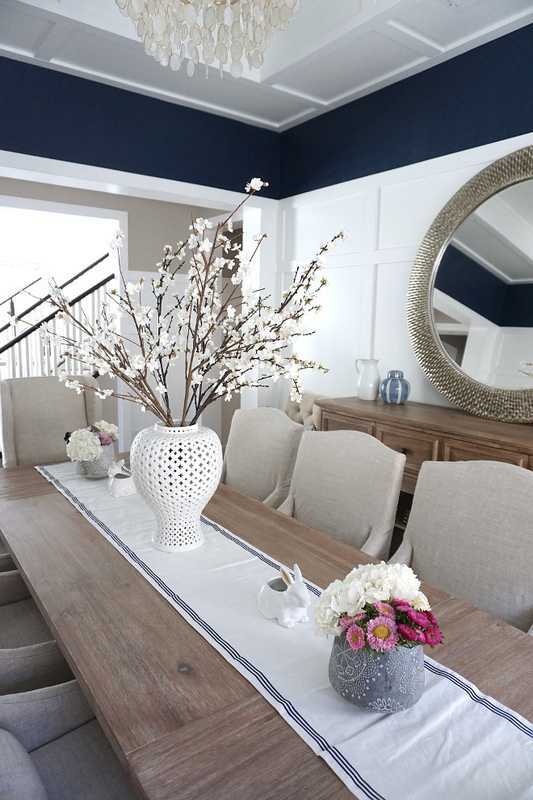 I feel honored and very happy to share Melody’s perfectly designed home on the “Beautiful Homes of Instagram” series today and I hope you a minute to get to know her and to see how she designed every room. I know you won’t be disappointed. Hello my name is Melody and I am behind “@MyHouseOfFour” IG. I am very excited to be featured as one of The Beautiful Homes Of Instagram. 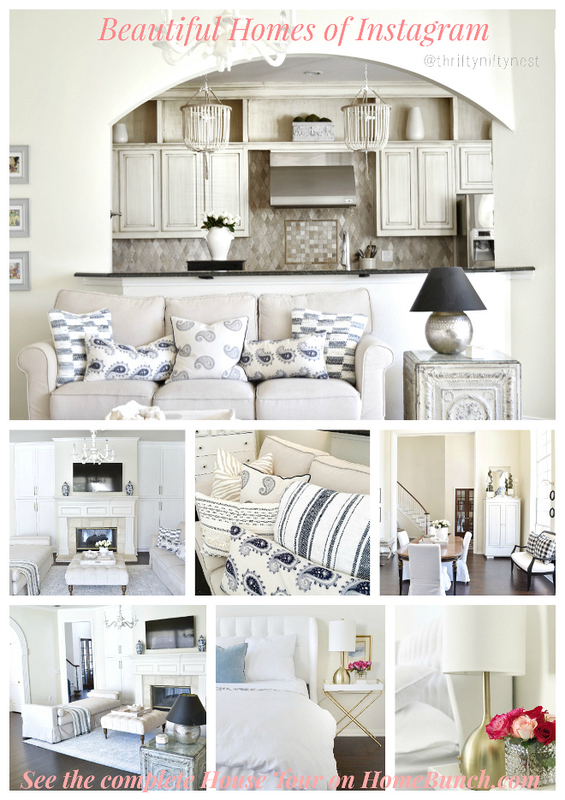 I have enjoyed immensely all the gorgeous homes Luciane has featured and I am super honored to be one too! I was born and grew up in South Africa and I trained in classical dance and graduated with a Business Degree. I have always been very passionate about interior design and styling ever since I can remember. 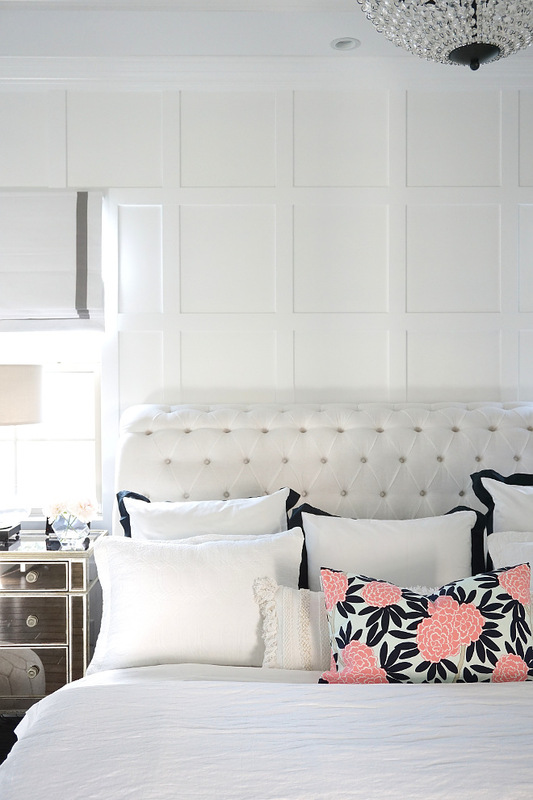 My first bedroom makeover as a 12 year old I was very particular on creating the perfect “blush” as my wall color. I also was very fortunate to travel and work in Europe and Asia because I followed a dance career in my early twenties. Later, I immigrated to the US and after living in Chicago and California I settled in Las Vegas. I am married and mom of two growing boys. My husband, Roger and I own and operate a talent and event company based here in Las Vegas. After having two boys we realized we needed more space desperately and decided to build in beautiful Southern Highlands, Las Vegas. We love the neighborhood, all the beautiful parks and it is in a good school district. 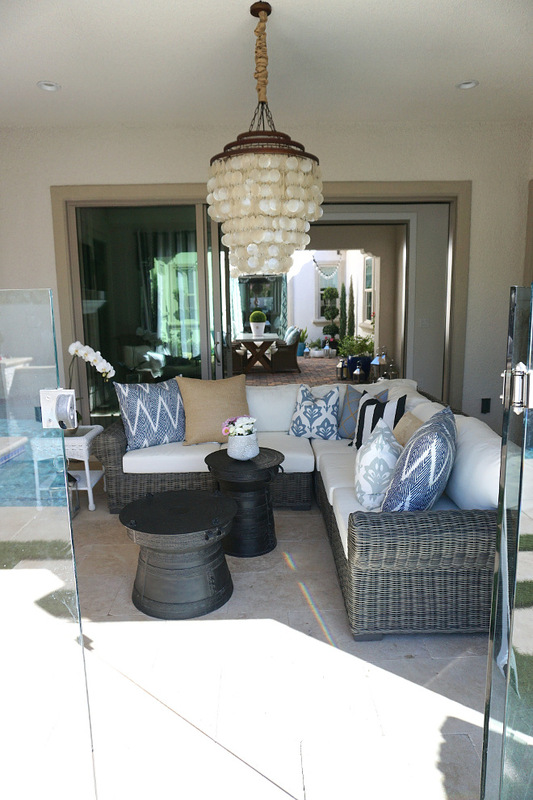 Luckily for me my husband allows me to make every design decision from the finishes, furnishings and accessories to the exterior of our home. I have come up with all the design decisions and worked with my contractor closely to implement them. The backyard I did come up with the design concept and all the finishes and hired a pool and landscape contractor. We still have the second level to complete. This space is designated to our boys bedrooms and playroom. I am planning to complete this project by summer this year. I would describe my personal design style as neutral, clean, comfortable, leaning towards classic but with a coastal vibe and edgy twist. 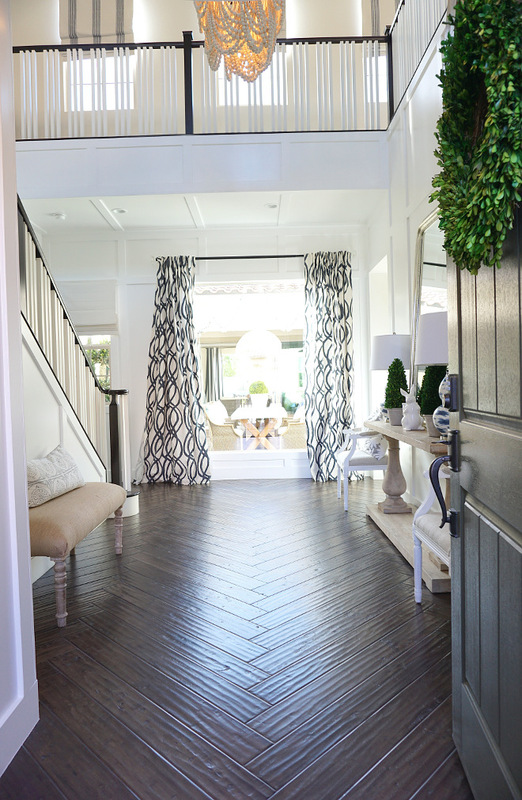 I wanted a bright foyer and decided to install the wood floors by Provenza Floors in a herringbone pattern. 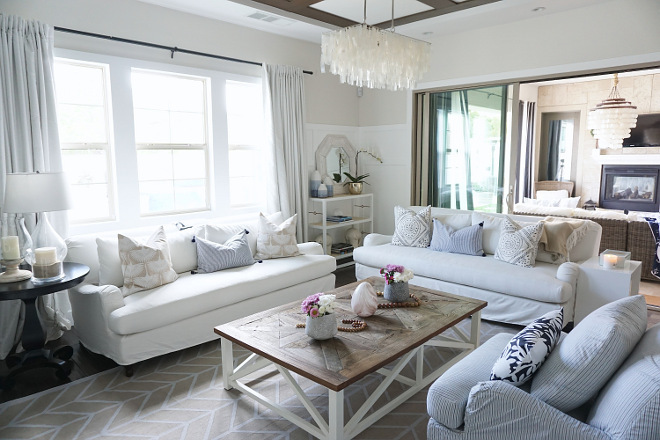 I also chose the pretty Amelia Chandelier from Pottery Barn. Drapes: West Elm Cotton Canvas Scribble Lattice Blue. Ceiling Paint Color: Behr Pro dead flat I300. 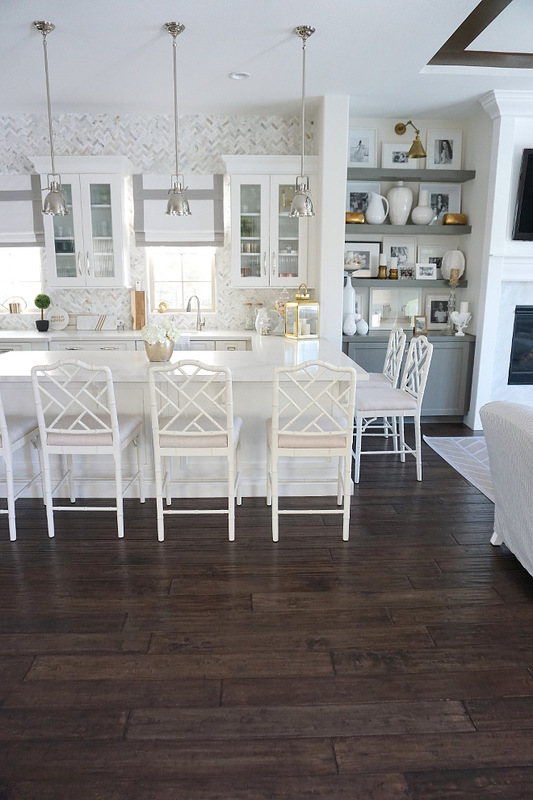 White Paneling Paint Color: Mohawk White Satin M625-0507 (Throughout the House). 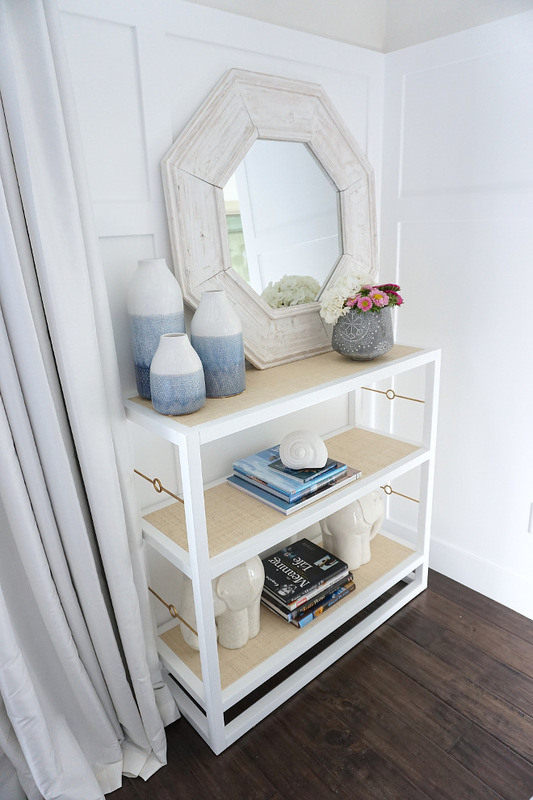 The console table and mirror are Pottery Barn closeouts that I got a great deal on. 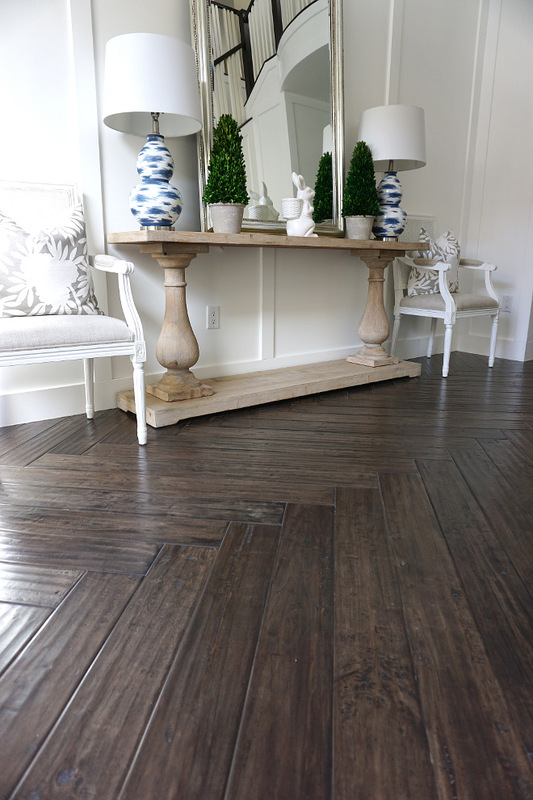 Flooring: Antico Provenza Vintage 547. I also added some beautiful chairs and pretty pillows from Caitlin Wilson. The table lamps I scored at HomeGoods. 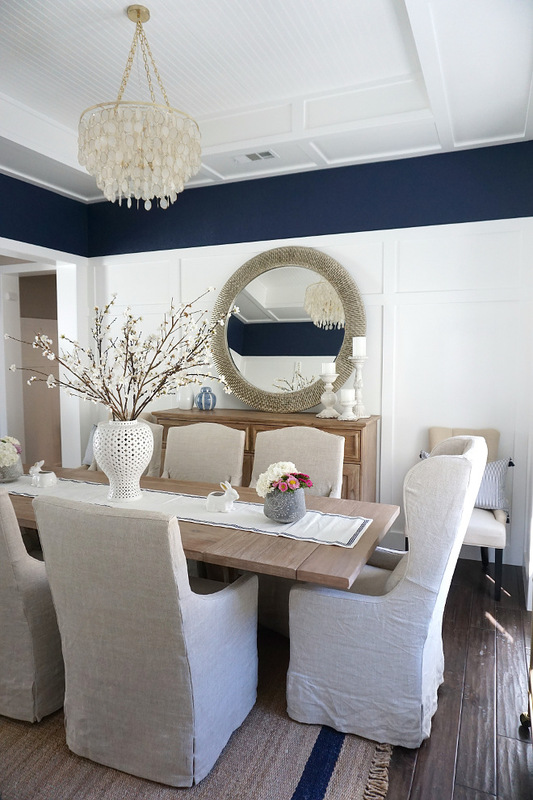 The wall paneling continues here in the dining room and I decided to add beaded board in the ceiling niche too. 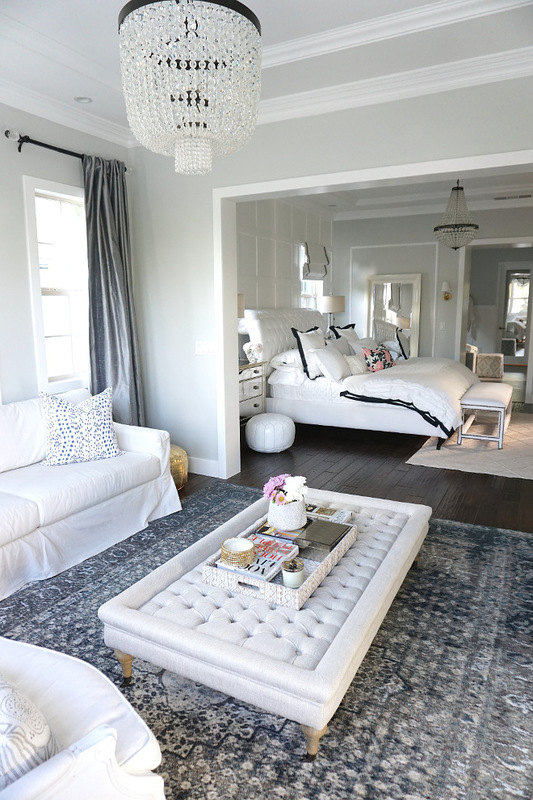 Rug is from Serena & Lily. The Roman shades were clearance from Pottery Barn. 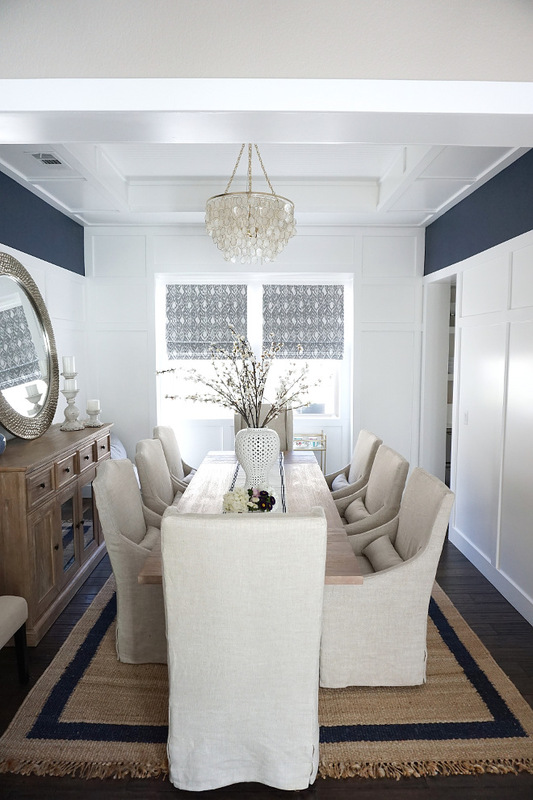 A pop of blue above the paneling. Paint color is Behr Night Flight S520-7. 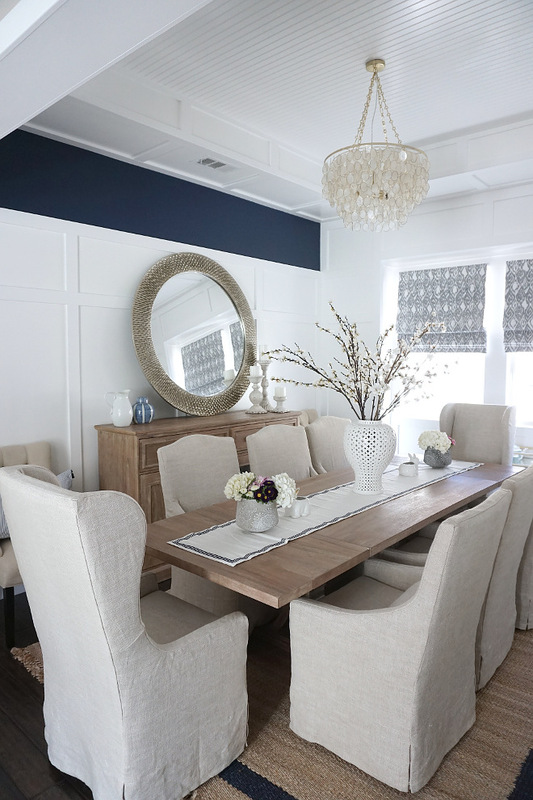 Table and banquet is from our previous home – Z Gallerie and I added the slipcovered chairs from Restoration Hardware. The ceiling chandelier from Horchow. Mirror is Z Gallery. 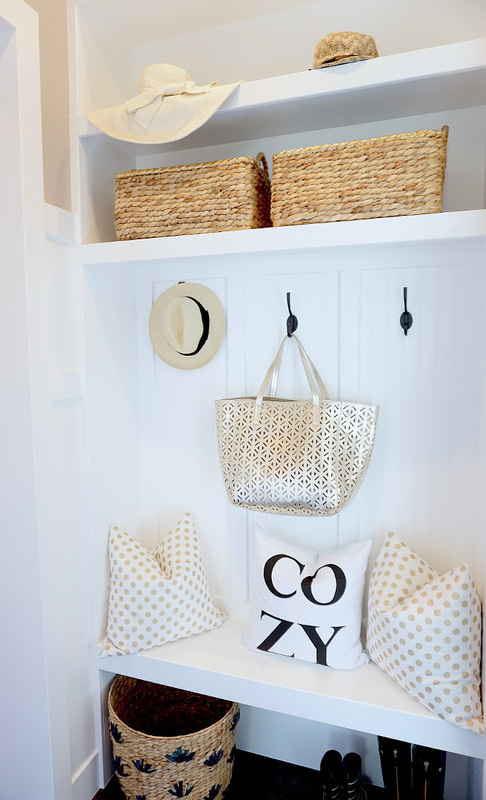 I love this added storage space. 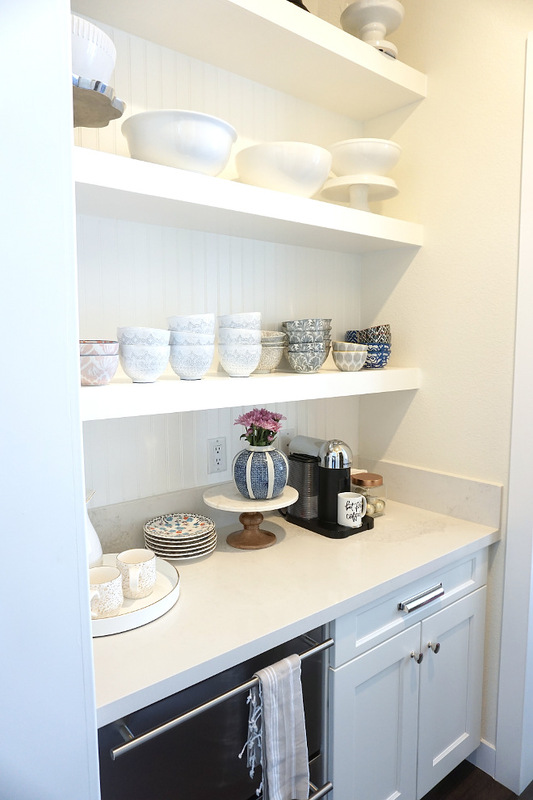 I saved by adding floating shelves instead of upper cabinetry and added the beadboard behind too. It is also where I display my favorite bowls and platters. I decided to add refrigerator drawers so my boys could access waters and snacks easily instead of using the kitchen fridge. 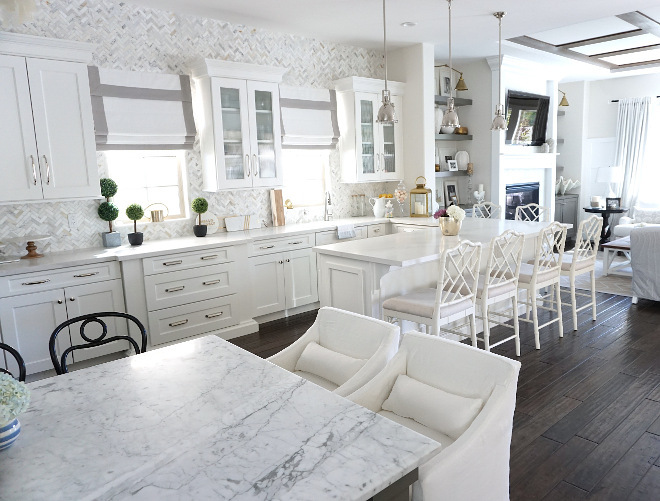 I wanted a white open kitchen that had several spaces for food prep and our family and friends to congregate. A white paneling was added to the ceiling where there was a slight ceiling pop out. The center island has a built in table that seats 8 and features carrrara honed marble counter. Wall paint color is Behr Shoelace OR-W13. 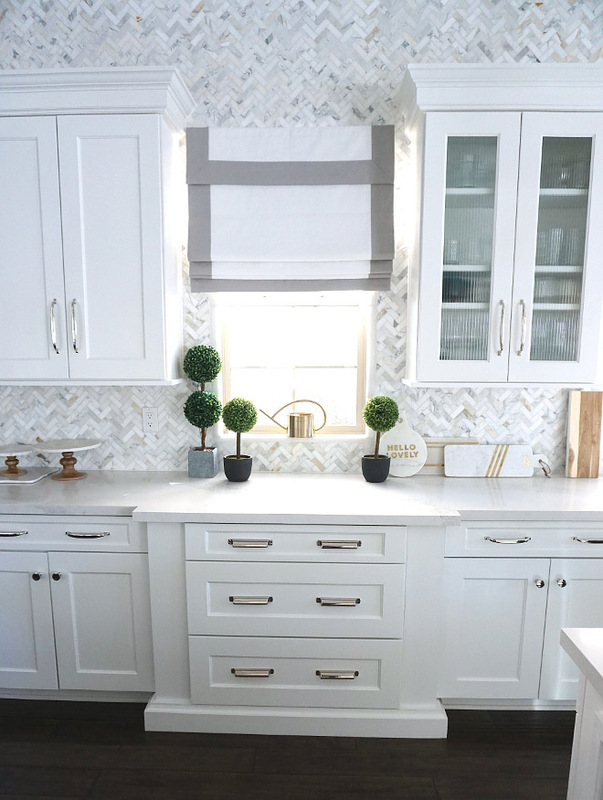 The grey kitchen island paint color is Benjamin Moore Flint. The cabinetry is from Mid-Continent cabinetry. 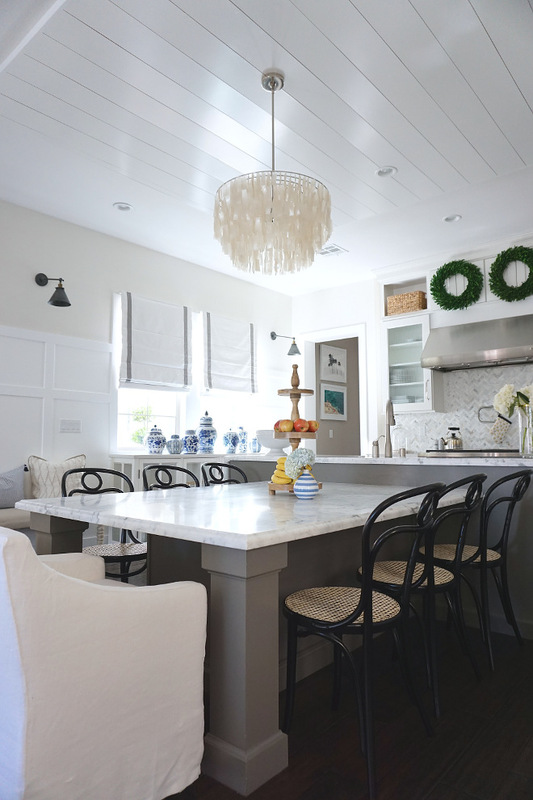 Chandelier above the built in table is from West Elm. The runner is from Rug USA – Overdye RE31 Leaflet Fountain Rug Pink – Style # 200SPRE31A – Tufted 100% wool rug. China cabinet is from Restoration Hardware and the Roman shades are from Restoration Hardware Baby & Child. 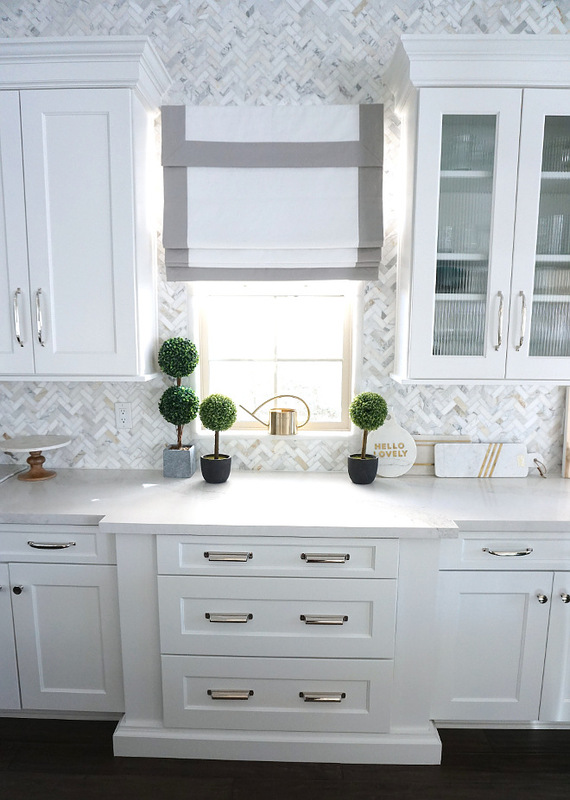 The kitchen backsplash is 1×3 Calacatta Gold Marble in herringbone. The cooktop is by Wolf. The kitchen island also houses 2 dishwashers for easy cleanup. 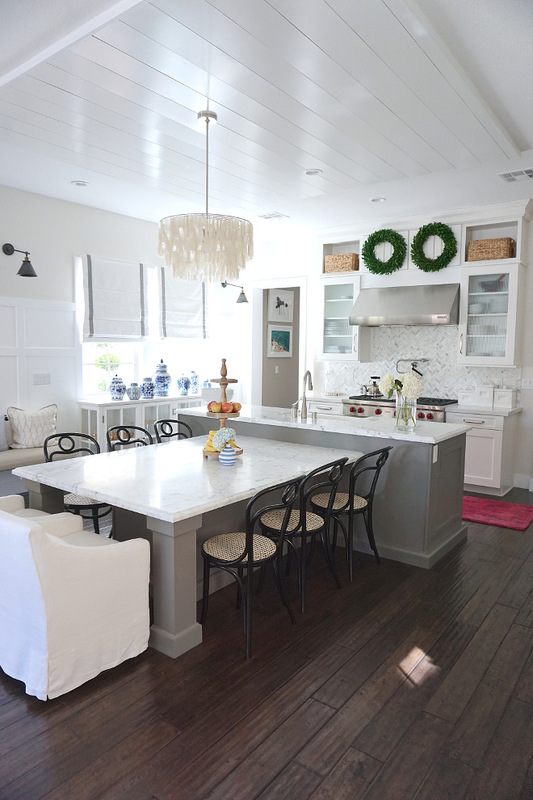 The eating area feels open to the family room and to the kitchen peninsula. 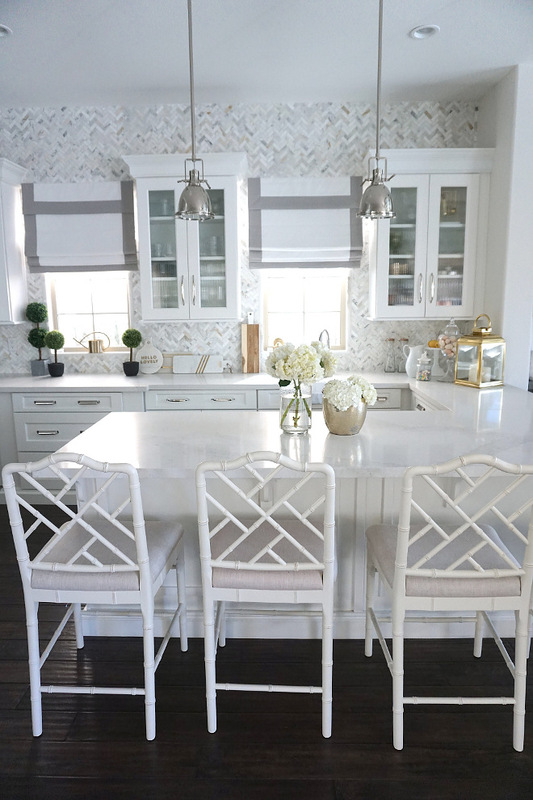 The white Chippendale barstools are from Ballard Designs. 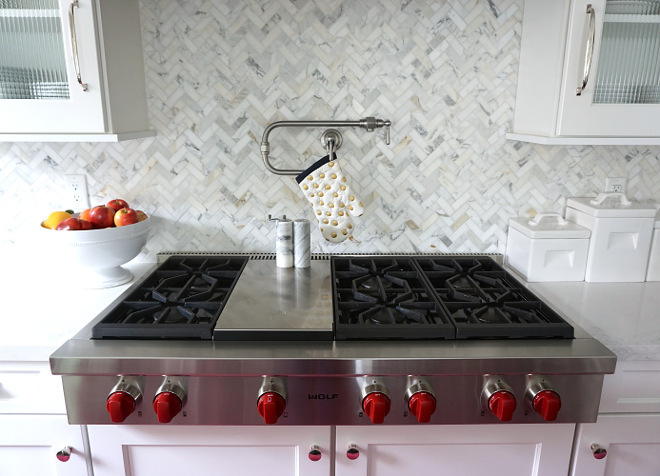 Backsplash: Calcutta Gold Herringbone goes all the way to the top of the wall behind the upper cabinetry. 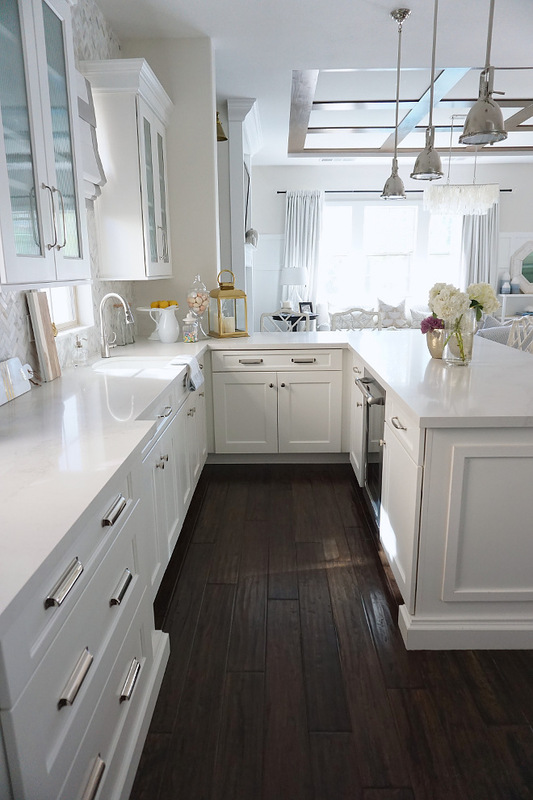 Perimeter kitchen counters are Caesarstone Calacatta Nuvo 5131. 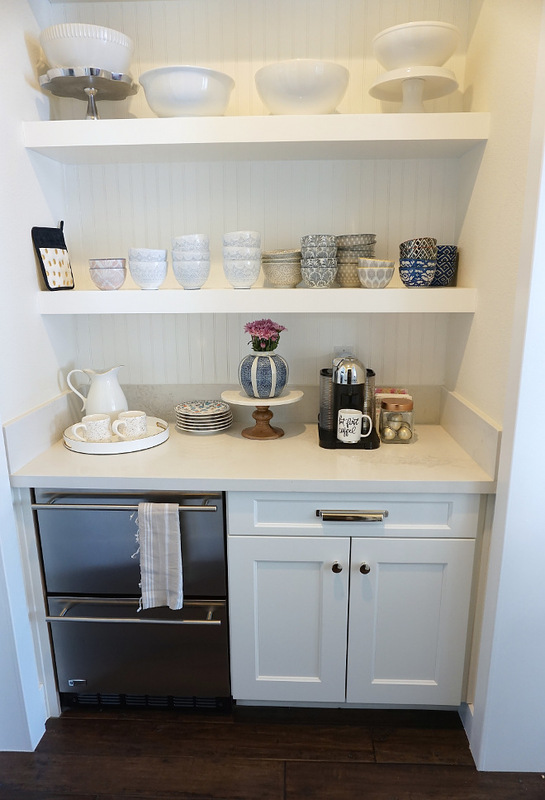 Shaker Cabinet Door Style: Parker & Newport from Mid Continent Cabinetry. Cabinet hardware is from Restoration Hardware. Lighting is also from Restoration Hardware. 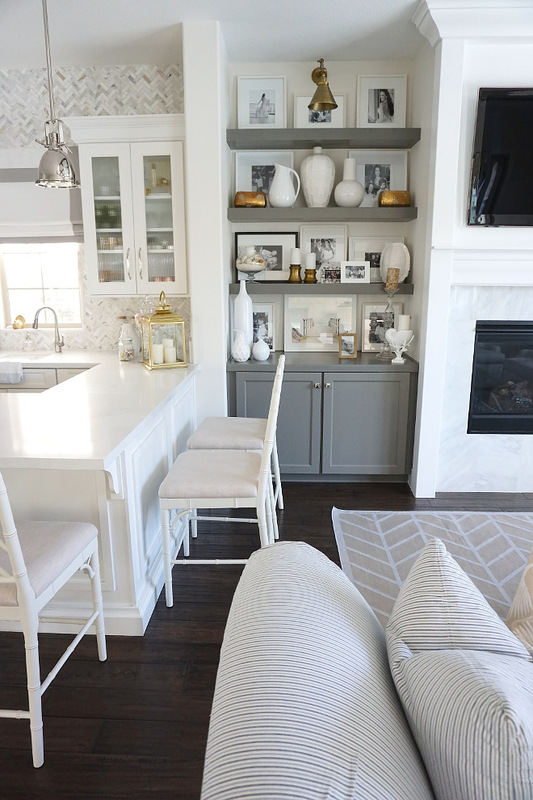 The fireplace centers the space – surrounded by a carrara marble tile and white trim and mantle. Floating grey shelves and lower cabinetry in Flint color by Mid Continent Cabinetry. The accent slipcovered chair is by Serena and Lily. 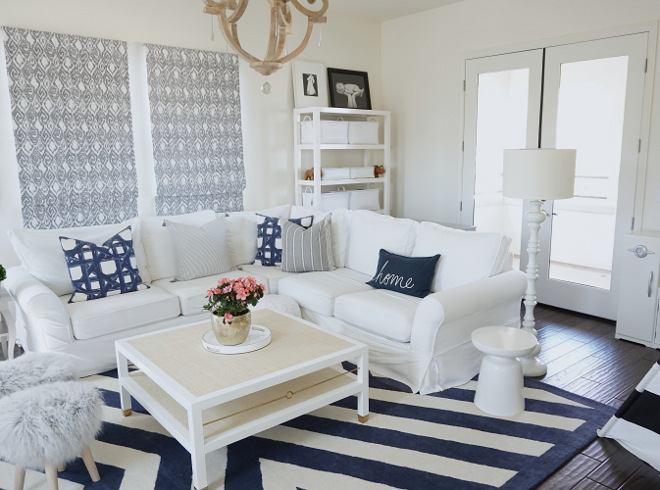 Accent pillows are from CaitlinWilson, TonicLiving and Serena and Lily. 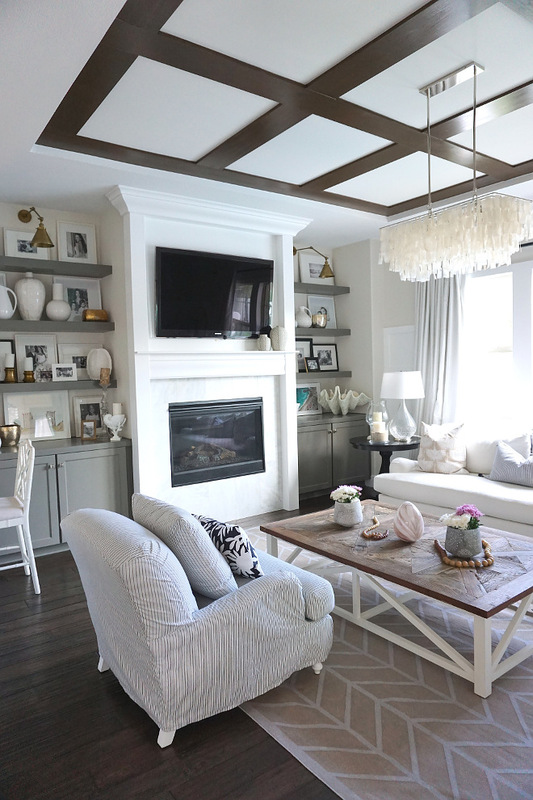 A classic white marble fireplace becomes the focal point of this living room. 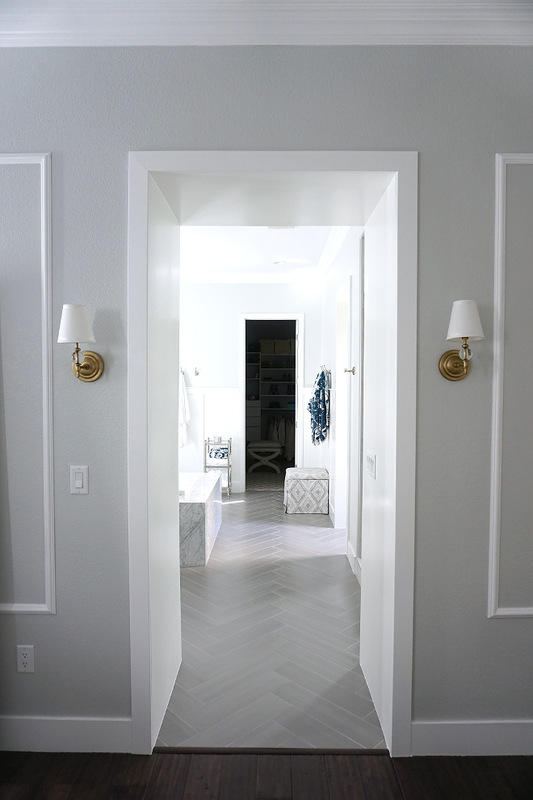 Lighting is from Restoration Hardware. Couches are from Pottery Barn with an oversized coffee table by Restoration Hardware. Beautiful decor can be found everywhere! 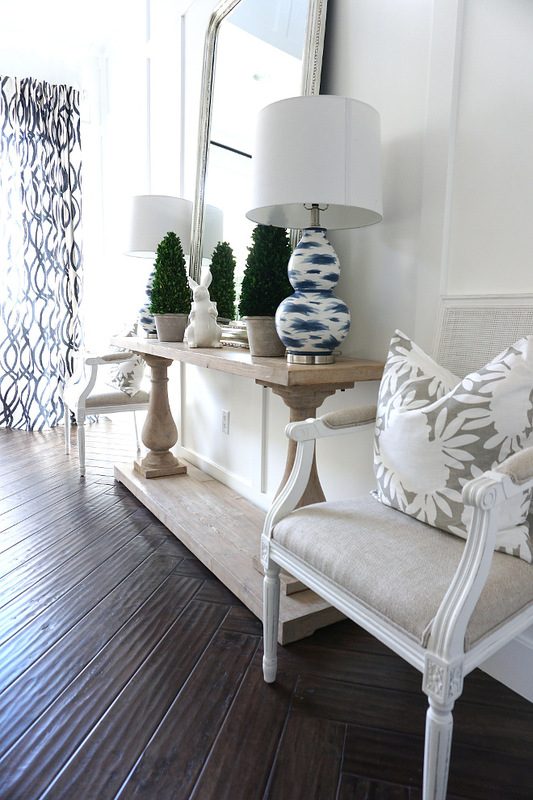 Console table is from Serena & Lily. For the ceiling, we added some drama with installing wood paneling stained in a dark expresso. Wall paint color is Behr Shoelace. Chandelier is from West Elm. 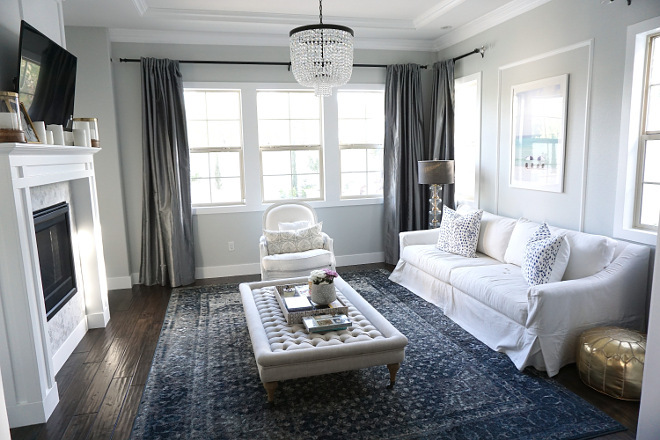 Rug is from Serena & Lily. 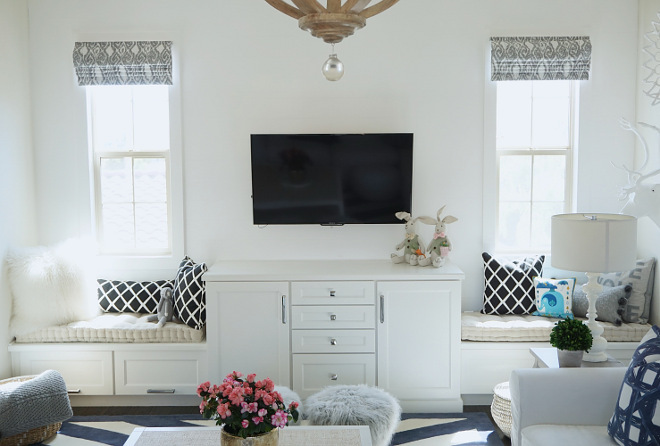 The playroom has built in bench and storage and white ship lap above the built in. I will be adding some ceiling treatment and painting the walls this Summer. Can’t wait! 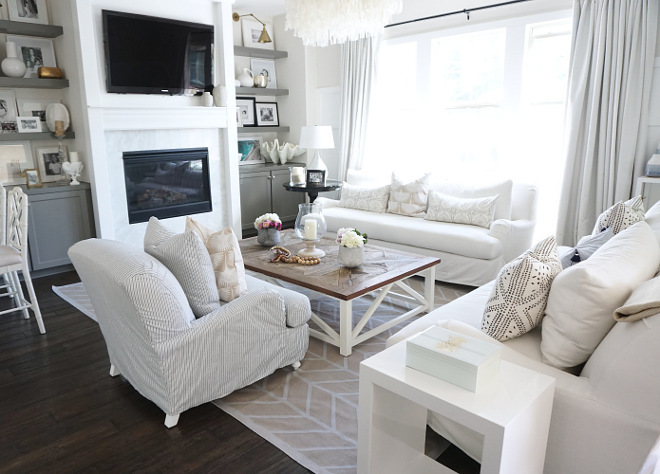 Coffee Table, pillows, and rug are from Serena & Lily. Sectional is from Pottery Barn. Pillows are Caitlin Wilson and the Roman shades are from Pottery Barn. Paint color is Sherwin Williams SW6385 Dover White. We just completed the master bedroom last summer. 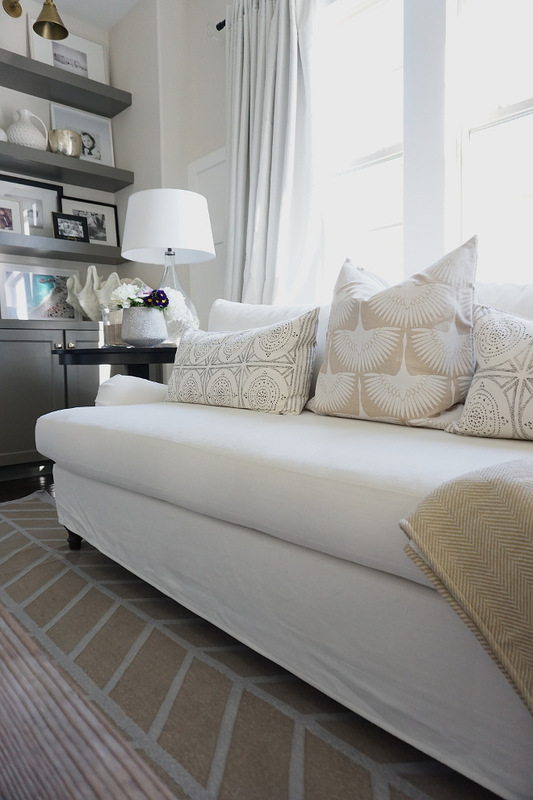 I wanted it to be light and airy so that almost any fabrics could work with it. Our bed we have had since we purchased our first home over 8 years ago and is tufted in white linen from Z Gallerie. Bench is Serena & Lily. 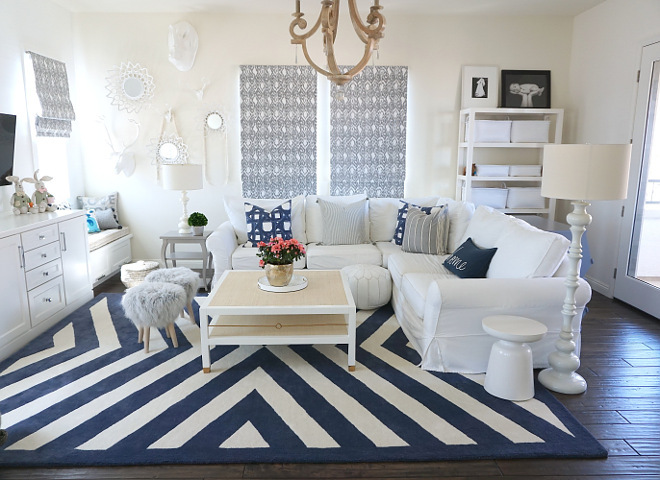 The accent pillows are from Arianna_Belle, Anthropologie and Caitlin Wilson. The dressers are from Z Gallery. White pouf is from HomeGoods. Chandelier is from Pottery Barn. 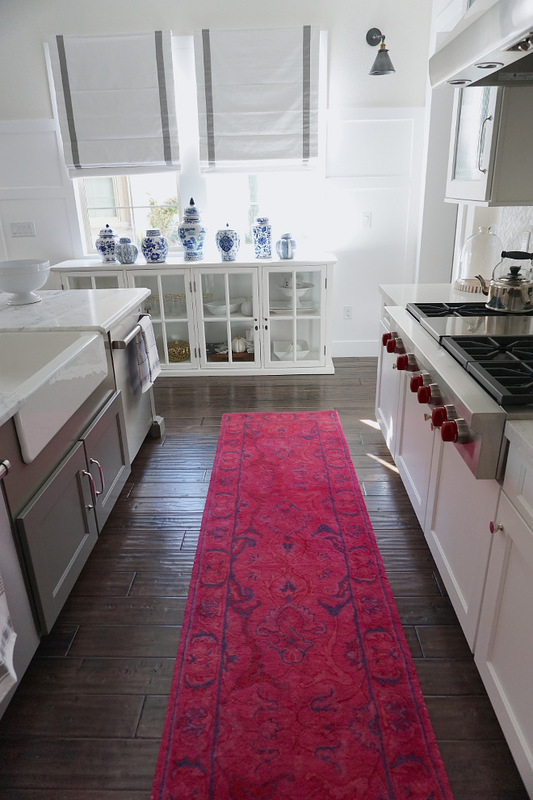 Rug is from Serena & Lily. The master bedroom opens to a sitting area. Paint is Benjamin Moore Sleigh Bells 1480 reduced 25%. 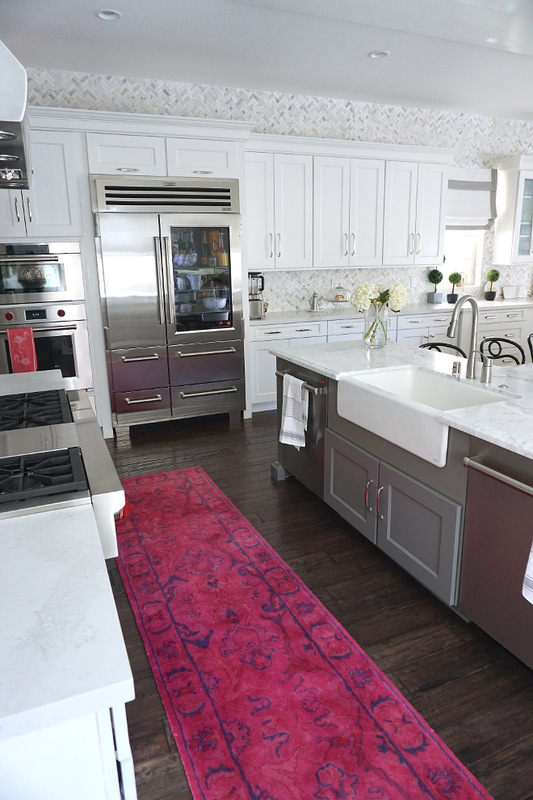 Rug is Arianna – Belle from Rug USA. The sitting area features a dual fireplace between the suite and covered exterior loggia. 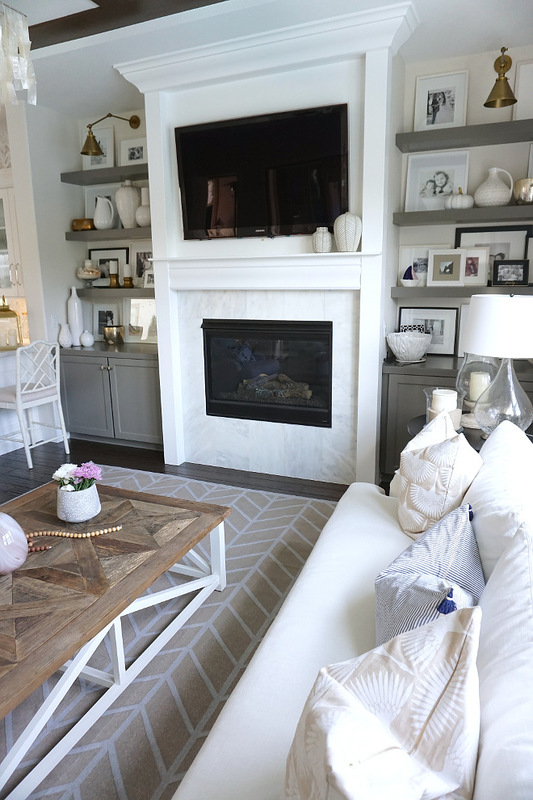 Pretty hexagon carrara marble tiles and white mantle dress up the dual fireplace. Couch is from Pottery Barn and chair and ottoman are Restoration Hardware. 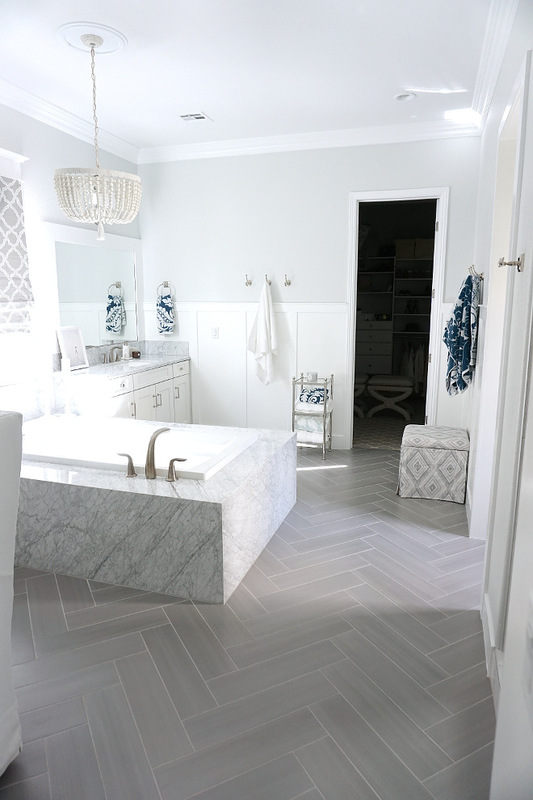 The master bedroom opens to a beautiful ensuite with grey herringbone floor tile. Lighting is the Dauphine Wood Pendant from RH Baby & Child. 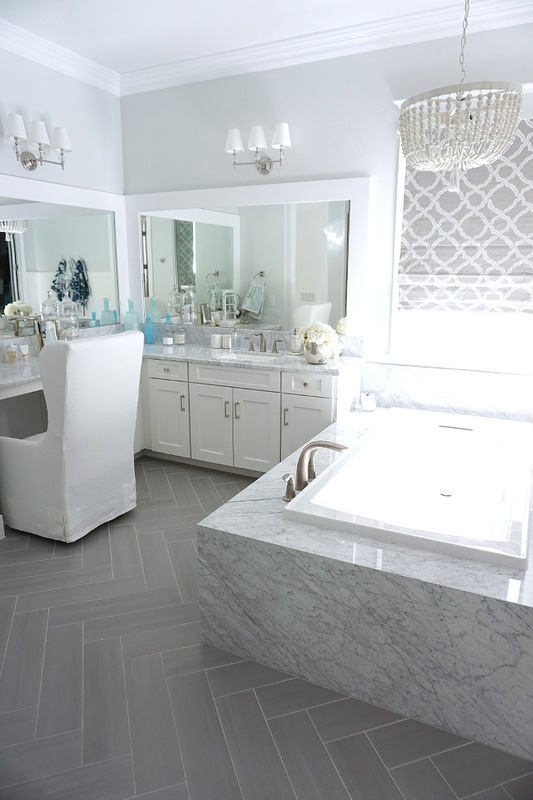 The bathtub is surrounded by polished carrara marble slabs. 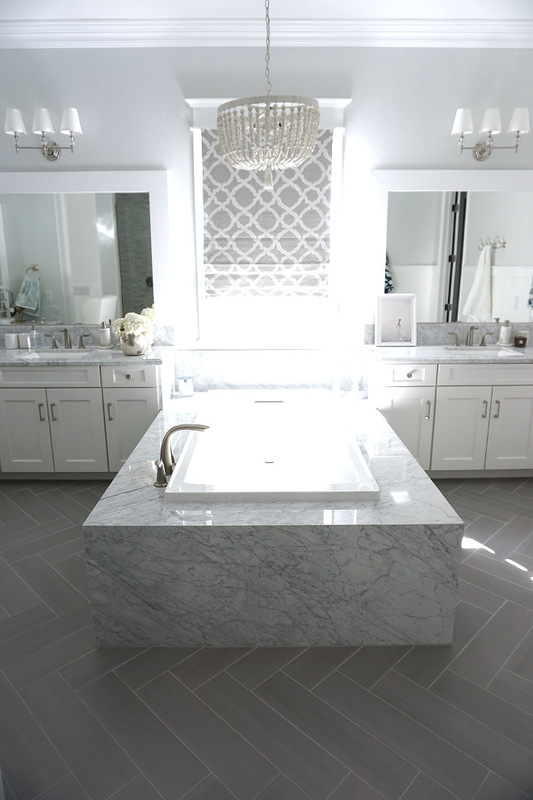 The ensuite also features a spacious vanity. 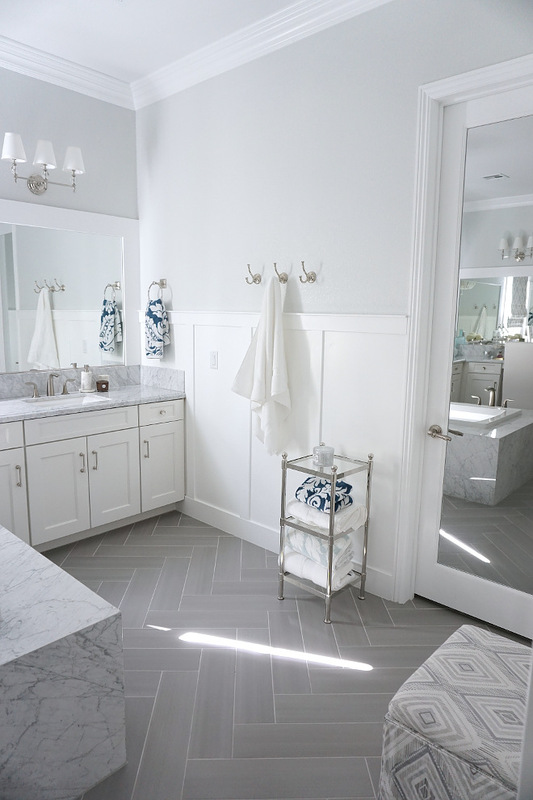 White wainscotting contrasts against grey walls and floor tile. 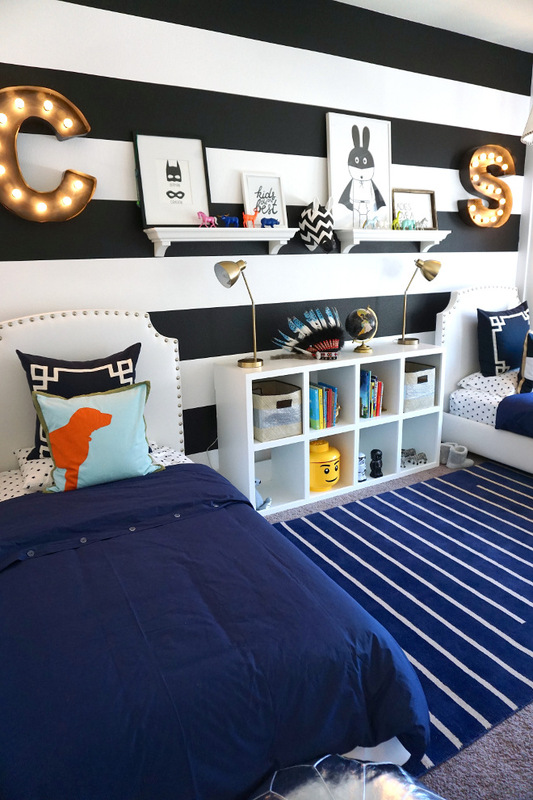 The boys wanted to share a room so I added a set of twin beds from Serena and Lily with a fun striped rug from Pottery Barn. The stripe wall color is painted. 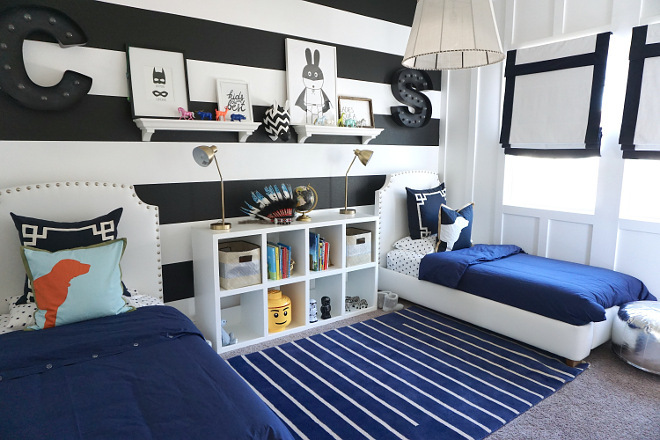 Black and White Striped Wall Paint Color: Black Stripes Paint Color: Behr Black 2300 in Eggshell. White Stripes Paint Color: Benjamin Moore Chantilly Lace. 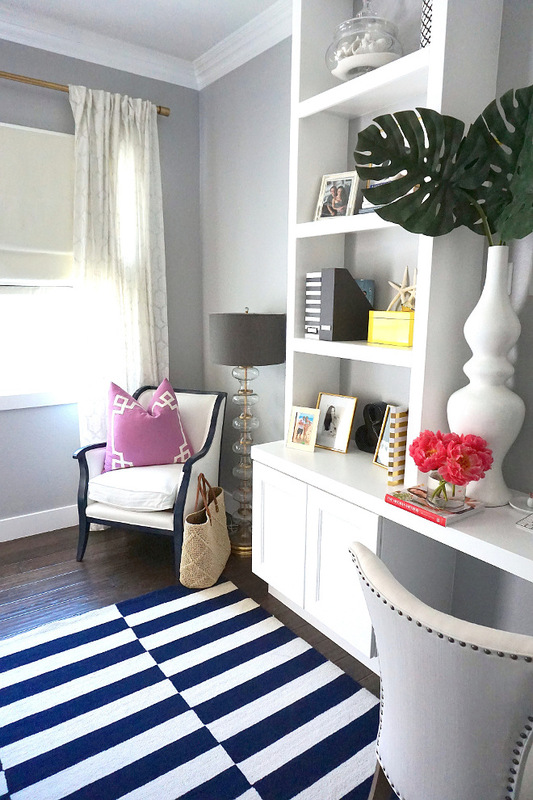 The home office features a built-in desk and grey walls. Paint is Benjamin Moore Sleigh Bells. 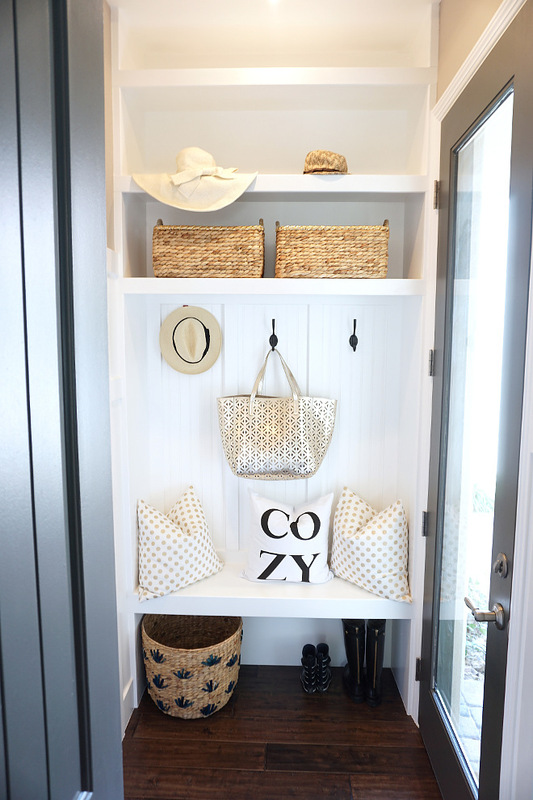 A practical mudroom keeps everything organized by the patio door. 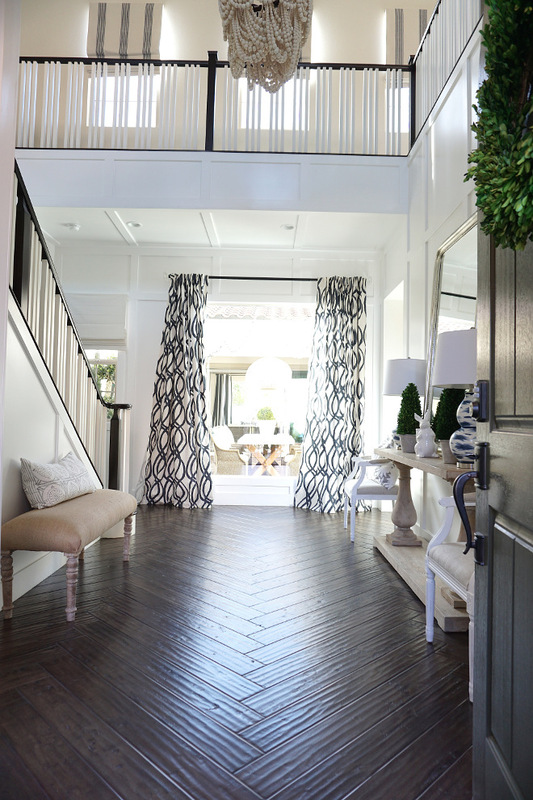 This cozy loggia features an outdoor firplace and plenty of comfort and style! Decking is stamped concrete with a cool deck paint and travertine pavers which continue into the covered loggia. The pool and spa was designed and built 3 months after we moved in during winter. I added the turf for less maintenance and to be environmentally responsible too. 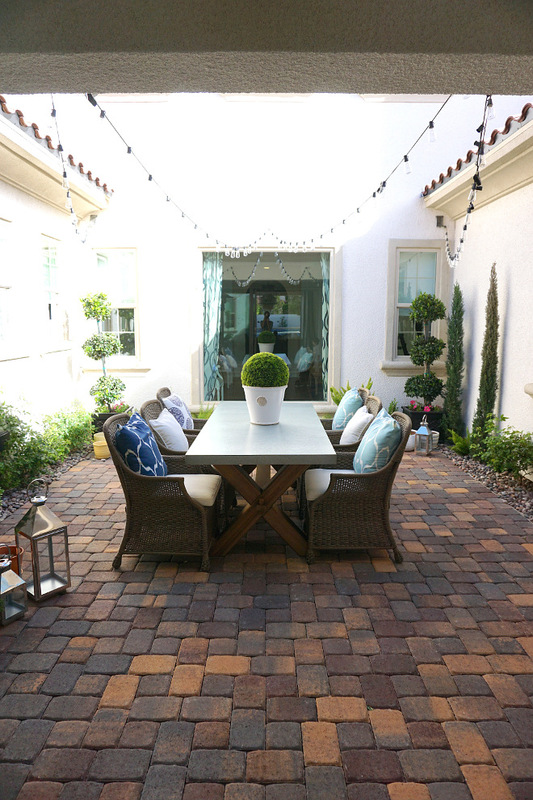 This courtyard is perfect for summer parties! @ThriftyNiftyNest: Beautiful Homes of Instagram. 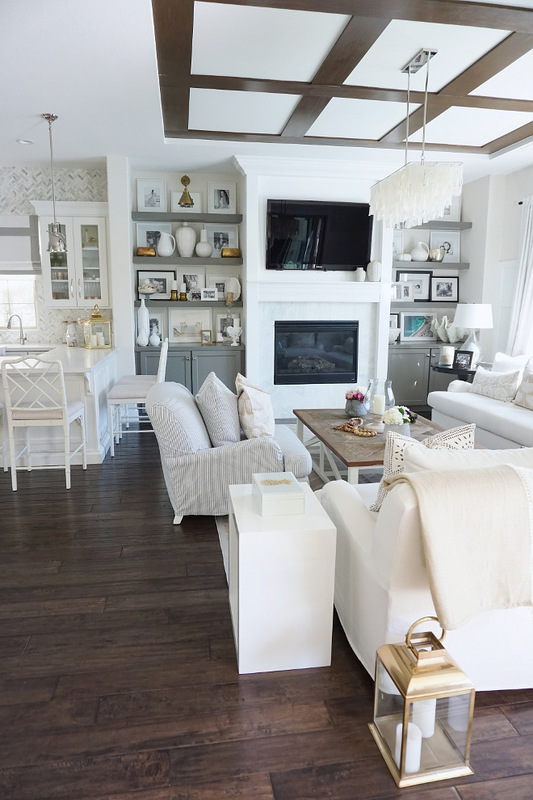 @TheGrayCottage: Beautiful Homes of Instagram. @loveyourperch: Beautiful Homes of Instagram. @greensprucedesigns: Beautiful Homes of Instagram. @House.Becomes.Home: Beautiful Homes of Instagram. @HomeSweetHillcrest: Beautiful Homes of Instagram. @Whistiques: Beautiful Homes of Instagram. How are you feeling today? Isn’t it great to start a new week seeing a beautiful home like this? 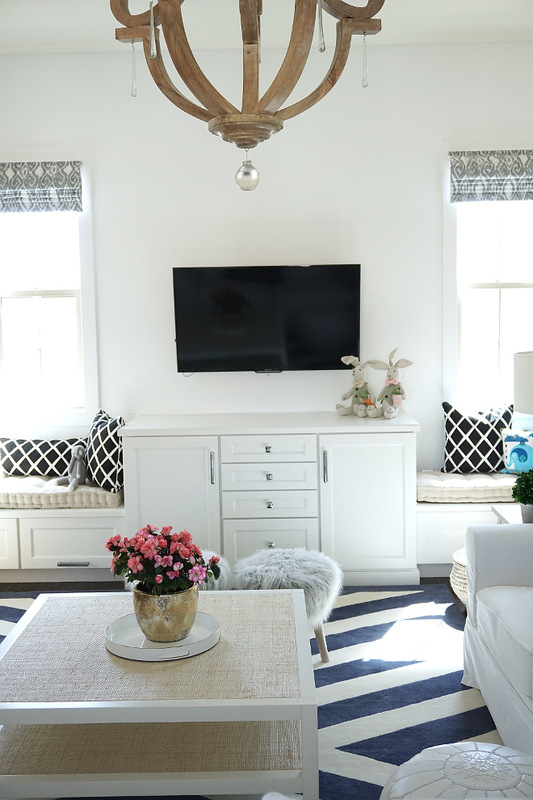 I love how the homeowner brings her taste and her style into every space. I strongly feel that our home should be a reflection of ourselves and we should love where we live. I hope you have a Blessed week, filled with Love, Happiness and Health!